The PPM Technology mini interface board (m-ifB) comes complete with a built in Formaldemeter or Glutaraldemeter unit which is designed to connect to third party systems. The interface board can be configured to give different voltage outputs; a 4–20mA current output and also give a relay alarm output. Various modes of operation are available to suit a whole array of uses, applications and situations. There is a configuration menu available to allow the user to choose output type, operation mode, select output tests, sampling range and also calibrate the Formaldemeter or Glutaraldemeter. 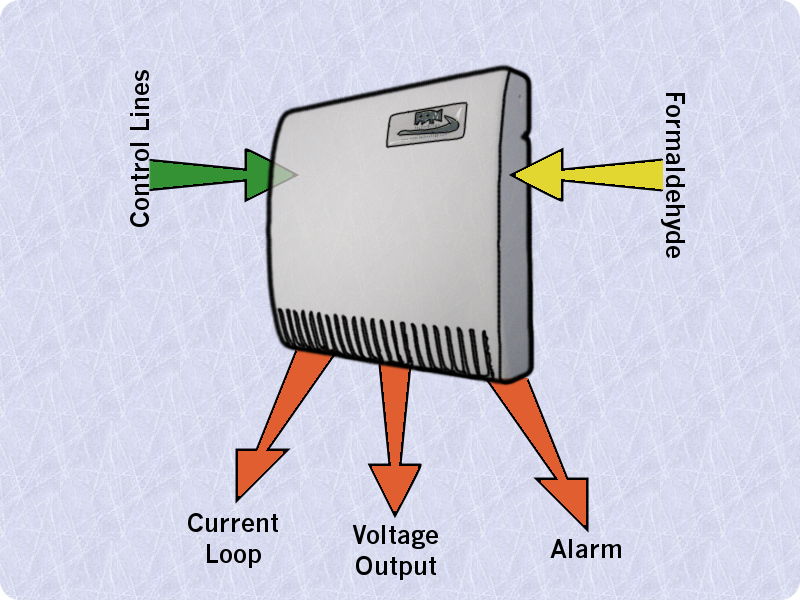 The menu also alows for the incorporated voltage-less relay to be triggered at various concentrations so that external equipment can be controlled. The Mini interface board (ifB) comes complete with a Formaldemeter htV or Glutaraldemeter, and is fully calibrated and ready to use. Simply connect your external outputs up to the mini ifB and switch on. In this mode samples are only taken when a valid pulse is detected on the sample input line. If the instrument has not cleared sufficiently to sample at this point then the sample will be delayed — as soon as the instrument is ready then a sample will be taken. This is ideal for use with PLC or other controller based systems as the sampling rate is controlled by the input lines and the current status is available as logic levels on the output lines. This mode does not require any external trigger for sampling. Samples are taken as often as possible by the Formaldemeter or Glutaraldemeter. The sampling duration would be dependant on sample concentration (higher concentration samples will take longer to clear and will delay the next sample). This mode is easy to setup and is ideal for applications where no controller based systems are available and the sampling frequency can vary. This mode does not require an external trigger but unlike the previous continuous mode it uses an internal timer to trigger samples at a set frequency. This can be adjusted by the user between 1 and 60 minutes in increments of a single minute. However, the sampling frequency is not guaranteed as samples may be delayed if the Formaldmeter or Glutaraldemeter is not ready to sample at the designated time.